Puppy worms, common in all dog breeds, are one of those things that people are reluctant to talk about, in polite company. 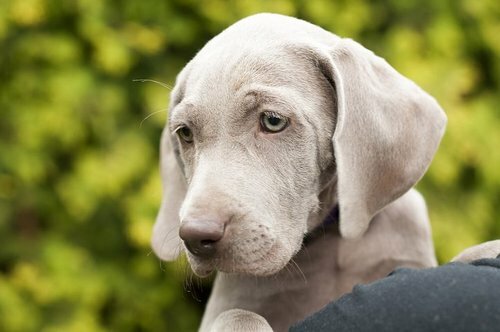 Most puppies get worms sometime, so you will probably have to deal with de-worming your new Weimaraner puppy. Granted, worms are disgusting! It’s important to understand is that worms in dogs and puppies, are totally natural. Not because of anything you did or didn’t do. You can often find out whether your pooch is having a worm problem by observing their poop. You may actually see the worms. And don’t be surprised if your vet recommends a de-worming schedule, giving your puppy worm medicine about every three weeks initially, as a precautionary measure. That’s a good indicator of how common this problem is for puppies! 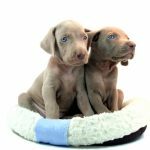 Puppy worms are natural in all puppies, including Weimaraner puppies like these cute little guys. How Serious are Puppy Worms? So how does your puppy end up with worms?. The first round of worms comes from the mother dog (sometimes while the pups are still in the womb!). In addition, both mosquitoes and fleas transmit worms, and humans can contract worms that they pass along to their dog unknowingly. Roundworms are an example of a worm that can pass between dogs and people. Hookworms, on the other hand live in the soil in Southern states, and the worms enter your puppy through her paws. If you live in the South, both you and your dog can get hookworms, if you go barefoot outside. 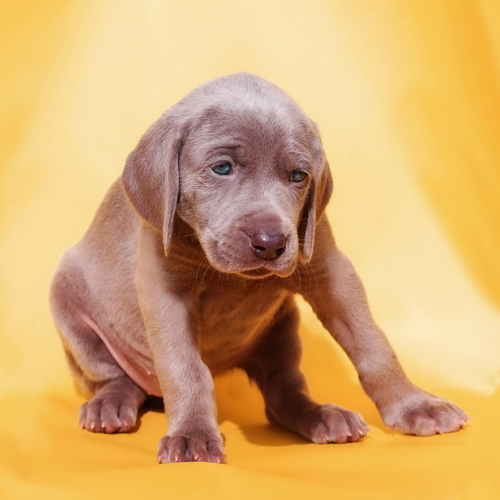 Left untreated, worms can make your Weimaraner puppy very sick. While they remain in his body, the worms or parasites consume nutrients that your dog needs. Left untreated, worms can eventually lead to your new puppy’s death. Worms are also notoriously fast at reproducing. That means that the sooner you can get your new puppy treated, the better. 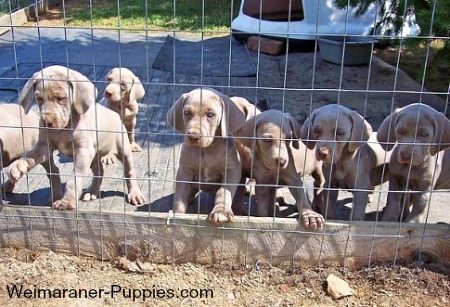 Also, if you’re getting your Weimaraner puppy from a breeder, they probably have already started the puppy on a worm protocol or de-worming schedule to protect the litter. This is a question that you should ask the breeder when you take your new puppy home. A distended stomach – That cute little fat belly may actually be a tummy full of worms. Your pup’s stomach should not be really fat. Overly thin dog – Your dog just doesn’t gain weight. Sometimes diarrhea and vomiting – particularly from ringworms. You may see worms if you look closely. However, if your puppy has diarrhea, it doesn’t necessarily mean that she has worms. You’ll need to look closer to determine the cause of her diarrhea. Worms in Your Puppy’s Poop – Tapeworms are normally detected in the dog’s feces. The best prevention against these critters is having an appropriate flea-fighting product. This is because fleas can give your dog tapeworms. If you suspect that your puppy has worms and want to confirm it, you can get an at-home worm detection kit so you absolutely know for sure. Of all the types of worms in puppies, hookworms and heart worms are the two most serious. A hookworm can lead to such severe low red blood cell counts that your dog could die. Heart worms, as the name implies, attack the heart and they are very difficult to remedy. Most commonly, your veterinarian will recommend regular worm medicine as a preventative, for the rest of your dog’s life. Worm medicines can be harsh on your dog. They are poisons, literally. If your puppy is taking a de-worming medication, you can give her Bene Bac Plus powder to minimize the side effects. If your dog or puppy has worms, you can handle this inexpensively at home. Virbantel will get rid of roundworms, hookworms and tape worms. Often you will see diarrhea in puppies after worming. This is one of the side effects, so you should be prepared to handle the puppy diarrhea. If you see blood in your puppy’s stool and she has diarrhea and vomiting, you should consult your veterinarian. You can prevent and treat dog parasites naturally, just as dogs treat themselves in the wild. Wild animals seek out natural herbs instinctively to get rid of parasites. If they weren’t able to get rid of the worms, none of them would live to be very old. 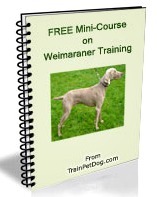 Many Weimaraner owner opt to use a topical product to kill fleas and ticks on their dogs. Most require a prescription from the vet and are expensive. Ovitrol X Tend can be ordered without a prescription, and it is affordable. Pet Wellbeing has developed an herbal product for canine parasites that works to strengthen the digestive system and eradicate the worms. Why strengthen the digestive system? Isn’t that irrelevant? Well, it really isn’t, because a dog’s digestive system is where most of his immune system is centered–just like in people. If you have a strong immune system, you are less likely to pick up parasites and more likely to get rid of any that you do acquire–and so is your dog! So, in the end, it is better to have a healthy dog with a strong immune system, than one that is weakened by taking the strong chemicals given to dogs to rid them of parasites. You can purchase Pet Wellbeing’s GI Cleanup Gold here. It can be used to heal your dog’s intestinal system after a bout of worms or to prevent another infestation.